When you finished a perfect makeup on the morning but past noon, the eye shadows disappear. The eye shadows sticks onto the double lid line showing the proof that you applied the eye shadows. 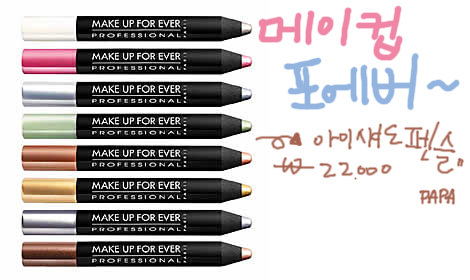 If you want to have lasting eye shadows and feel lazy to retouch eye makeup than use a cream shadow~!! Where there are no pores and oils, cream type product lasts long. Also glitter pigments don’t easily fall off so it is better to use cream type that has some glitters. This is pencil type so you don't need to have any skills; it’s easy to apply. Also it has high intensity on colors and it’s waterproof. There are varieties of color to choose from so it’s perfect to use. You can use this along or mix them. I don’t really like to use the 3 colors by itself because it’s not my color. So I like to mix them! The reason why I would recommend is that!!!! When you mix with inexpensive shadows it works nicely. The mixed colors are new and lasts really long unless you smudge it with your finger. 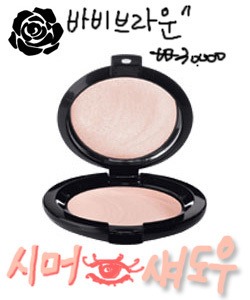 If you have some eye shadows you don't like to use try to get this one and mix with it!~~ you won’t regret it. 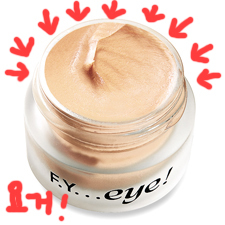 Even though it doesn’t lasts long, try to use eye primer and base. When there isn’t enough oil the eye shadows don’t stay long. Pick a primer that would hold oil and show off the intensity of the colors. So lets try to use eye primer! I was really satisfied with the Fresh eye primer but the price was too expensive so I had to look for another one. So I found this eye primer from Benefit, which was half a price compare to Fresh eye primer. The effect was the same it will be fine to use.